No doubt, Ebb and Flow systems are among the simplest and most effective hydroponic growing methods. That's why they have been favored by lots of hobbyists and commercial greenhouse growers. 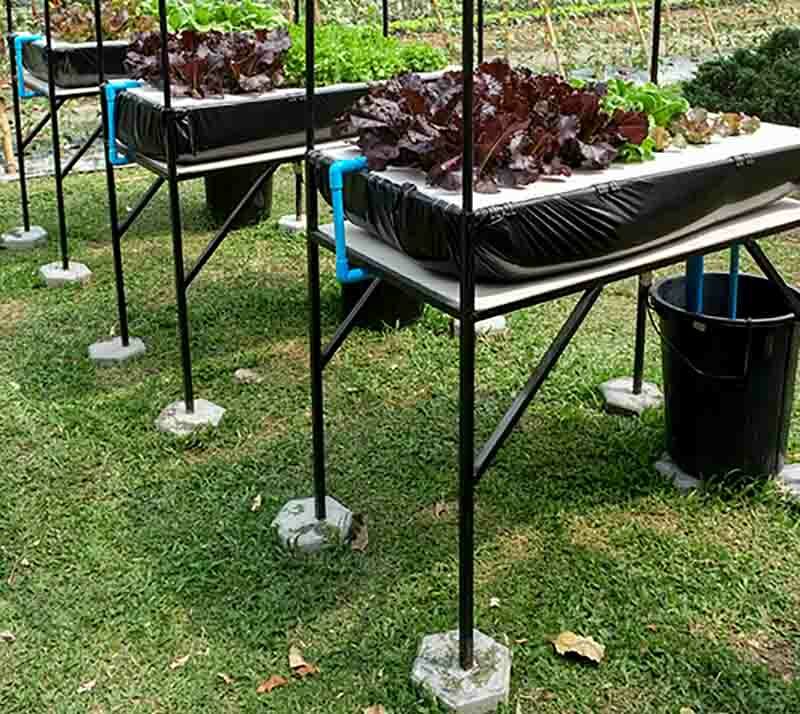 This is not the easiest to set up and require some efforts but it's not as complex as some advanced forms of Hydroponics, such as the Aeroponics. Understanding this technique's principle, you will find that you can utilize cheaply available materials to set up a DIY Ebb & Flow system, and scale as big as you want. Let's dig into this interesting growing technique. What is the Ebb & Flow? Ebb and Flow, or Flood and Drain is a system involves the periodic flooding and draining of the nutrient solutions. Basically, there are two phases of its operation. The Flood is when the water and nutrients flow the growing areas, flowing over the plants' roots. The drain is when the water drains back to the reservoir. These two actions take turn continuously, and hence their name. There is a timer which controls the water pumping cycle. When the timer goes on, the submersible fountain pump starts pumping water and nutrients. The nutrient solutions then flow up to the above container (grow tray), soaking the plants' roots until they reach the water limit. While at the set level, there is a continuous circulation of nutrient water in the system for a period. At this point, the overflow tube is instrumental in ensuring the maintenance of the standard water level. Moreover, this tube also prevents nutrient water from spilling out of the reservoir during circulation. When the timer goes off, the pump is halted, and nutrient liquid stops flowing in tanks. It begins draining back into the water reservoir via the drainage system. You need to ensure that you allow enough air into the system. Some growers prefer getting the air in the nutrient solution from over tube when it falls back to the reservoir. The overflow tube should be more extensive than the water inlet tube. 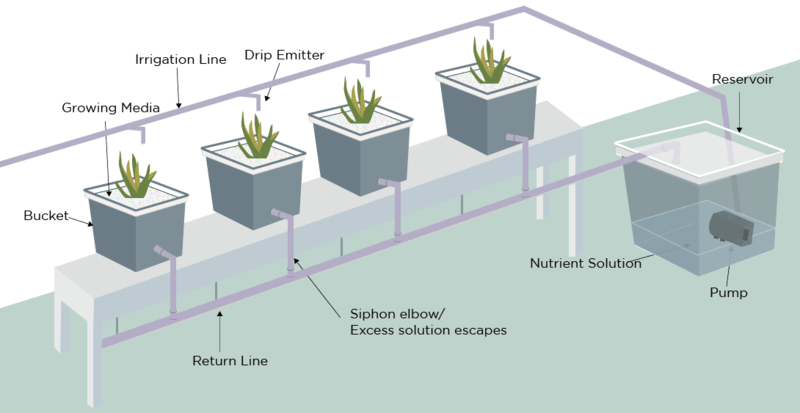 In essence, there are two main parts of the system - the reservoir and the plant tray. 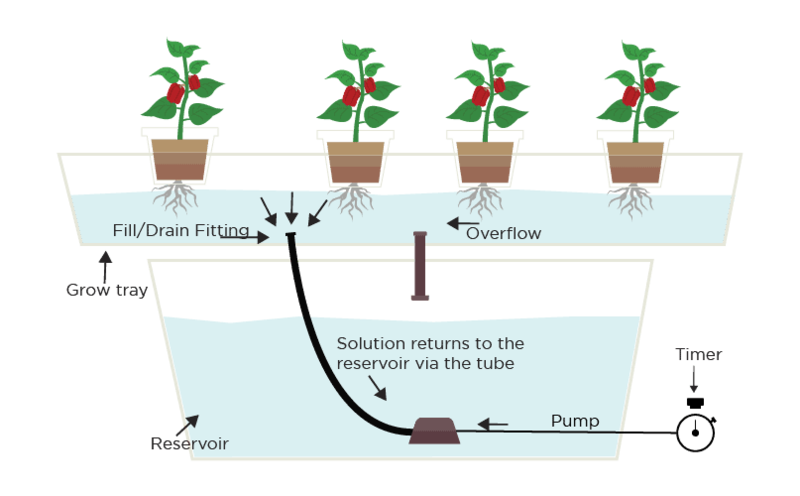 One othe essentialal parts of any hydroponic system is the reservoir. This contains water and nutrients that plants need. Normally, 1 reservoir is enough for most of the Ebb & Flow systems. 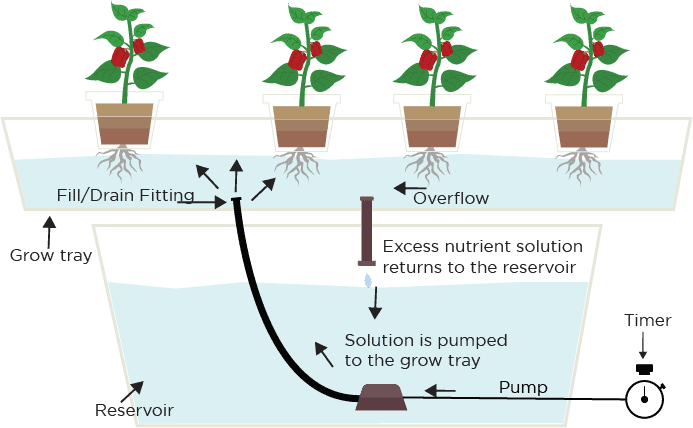 If your structure is big, the reservoir must also grow respectively, or you need some extra reservoirs to grow enough nutrients to more plants. 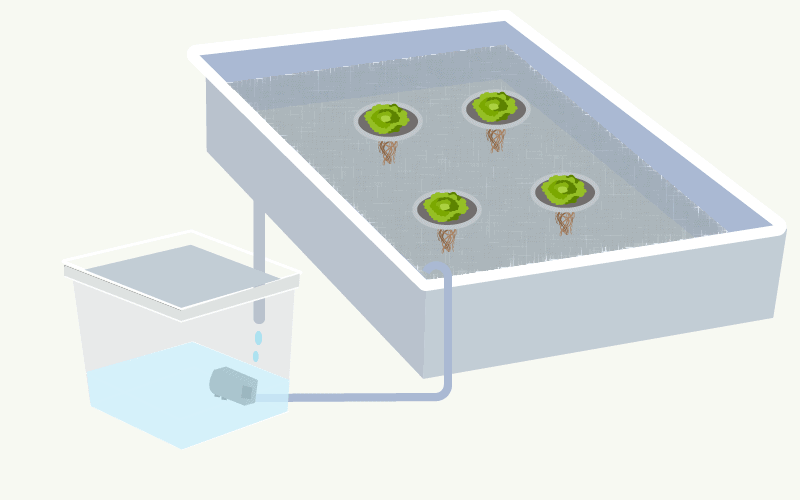 Submersible pond or fountain pump is vital in pumping water up into the grow tray. It is the heart of the Ebb & Flow system and you must take great care to purchase a pump with a strong flow rate in order to provide enough water for the growing tray in a short period of time. A timer is responsible for controlling the amount of time for the watering process. The timer goes on and off to ensure the plants receive the appropriate nutrient requirements. A container or plant bucket is essential in the system as it where the plant grows. It can be one big container/tray, or several small ones in a system. The function of the pipe is to connect the reservoir to the system to convey water in and out of the system. 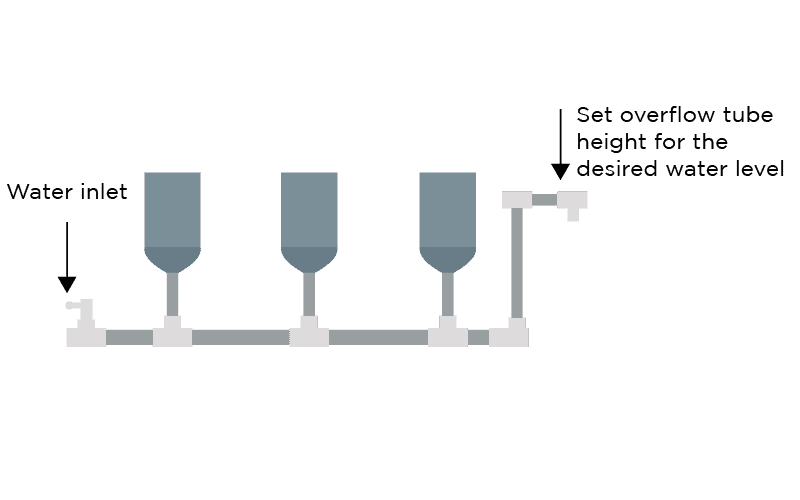 The critical function of the overflow tube is to set the level of height that the nutrient solution in the container reaches. The channel also works to ensure that the nutrient solution does not spill out of the reservoir. The water can overflow due to the pressure build-up during the pumping process. Because of the way the system works, the growing media for the Ebb & Flow must be strong and heavy not to be floated. Some suggested growing materials are gravel, hydroton, perlite, stonewool. One of the advantages of the flood, drain type of system is that the materials are cheap. There is also a chance for material improvisation. You can use simple tools such as buckets, tubes, bottle water, trashcans, and storage totes. So long as the devices can hold water, they are okay for use. There are varieties of flood and drain structures that use the same principle of using water pumps to provide plants nutrients, including. Flooding train design varies from the other models significantly. The system contains only one container for growing plants. The structure has a shallow rectangular or a squared tray on top of a raised surface. The location of the water reservoir is beneath the container. In the process of flooding nutrients to the plants, one side of the tank lets water in from the pool. Meanwhile, the opposite side enables water to move out from the container into the nutrient solution reservoir. The plants grow inside a plastic bucket placed in the flooding tray. The seedling in the bucket should contain the appropriate growth media. The responsibility of the overflow tube is to control the height of water in the container. Whenever one wants to transport the plant, the technique makes it easy. There are no creative limits to set up an Ebb & Flow system with a number of buckets/containers for growing plants. Usually, there are a number of containers/buckets connected in one tube. The job is to get the nutrient flows go through all containers/buckets evenly at set water level, before draining back to the reservoir via the tube. The dominant characteristic of the method is the presence of many containers. The pumps flood with nutrients evenly in all containers at the same time. And the position of the tanks/containers must be higher than the water reservoir. Only by this way can the nutrient solution return back to the reservoir through gravity. In the image above, the overflow tube plays a very important in controlling the height of the nutrient solutions that pass through every container. It is also adjustable so that you can fix the water as quickly as you can. 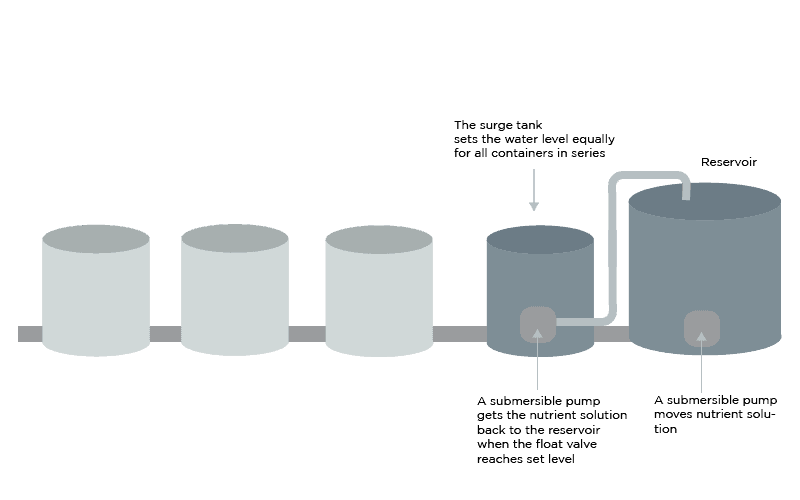 Rather than relying on the overflow tube for getting the water evenly in all containers, this design uses a primary tank (so-called the surge tank) for distributing water equally in all containers. This is a dual pump ebb & flow system. That means there is one pump in the reservoir for moving the solution into the surge tank and all containers. And another one in the surge tank to push the solution back to the reservoir. There is a submersible pump inside the surge tank that helps force the nutrient solution back to the reservoir (there is a float valve in the surge tank that turns on the pump inside it once the water gets set level). We cannot mention the ebb & flow system in series without talking about the famous Dutch Bucket. The Dutch Bucket is inherently a variation of the Ebb & Flow. Follow the image below and our detailed post to learn more about this system. Low cost. The cost of setting up the structure, buying materials, and maintaining the fabric is very affordable for everyone. Especially if you decide to improvise the parts, you may end up saving a lot of money. Nutrient abundance for plants is present. The system ensures that your plants obtain just enough nutrients. The overflow tube ensures that flooding in the containers is not possible. Therefore, your plants get to grow into maturity and are healthy and nutritious. It is easy to build up the structure. Unlike other expensive and complicated types of hydroponics, flood and drain do not require expert knowledge. Just reading this post, watch a tutorial, you can easily set up a stable and operational structure. It is easy to use. Once you set up the system, the hard part of the job is over. The rest of the work is straightforward, as it requires minimum supervision and maintenance. The simple tasks are ensuring availability of nutrient solution, and constant checking to confirm functionality. There is little need for technical assistance in using the system. Instances of unstable ph levels: when the structure fails, the water overflows into the containers and thus flooding the plant. The excess nutrients create unbearable PH environment that destroys the farm produce. There is the creation of toxicities that are harmful to the crop; this brings losses to the farmer. Breakdowns are common. Once you decide to improvise the materials and build your structure, you have to be extra careful. Any small mistake in the formation may cause the whole system to break down and stop functioning. Some of the frequent breakdowns happen in the pumping machines. 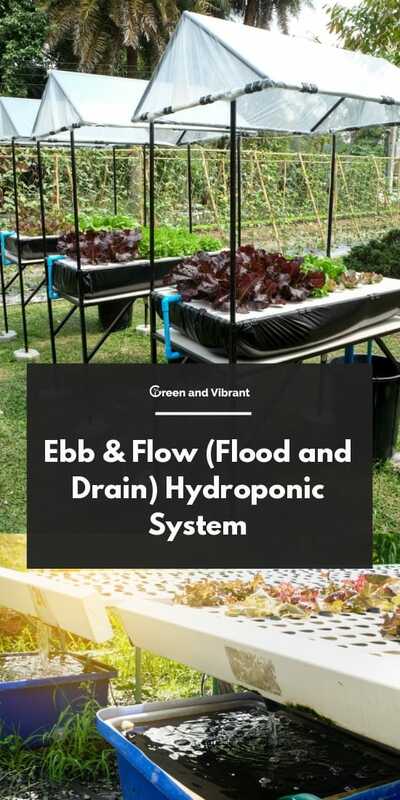 Ebb and Flow System is so effective, simple and flexible that it has a great place in Hydroponics, and Aquaponics as well. Commercial growers have used Ebb & Flow for growing plants, and fishes for years and enjoyed significant results. Hobbyists also find this system easy to set up and enjoy fresh food in their indoor garden. The Ebb & Flow is an integral part of the Hydroponic system and will stay.